Stamps R Us Challenge is in full swing right now. This is a challenge that lasts for two weeks and we're just now entering our second week with the theme of: Animals! 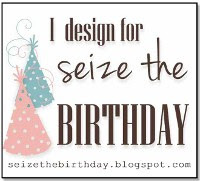 Come on over and add your creation and get a chance to win FREE images from Sew Many Cards. 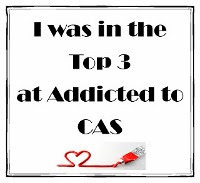 The winner AND the Top Three will also receive a badge to put on their side bar. 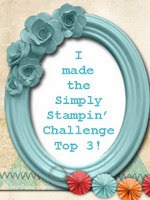 So be sure and stop by this wonderful challenge blog: Stamps R Us Challenges. 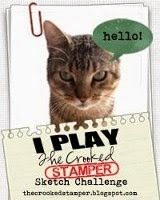 This little image is from Sew Many Cards. 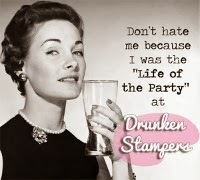 I'm not impressed AT ALL with my card today - but here it is anyway. This was just one of those that looked so good in my mind but not like I wanted it to look on paper. It's kinda like shopping for clothes - you know you see something hanging on the rack and it's just what you're looking for and about the cutest thing you've ever seen....and then you try it on and UCK! Anyway....the image is just adorable with him pulling that little cart of hearts and I think it'll make a cute card for a child. 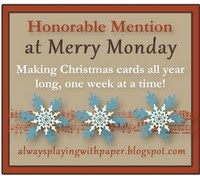 Monica, over at Handmade Cards With Love, passed this lovely Blog Award on to me! She is a sweetheart for doing this and she makes the most wonderful creations. Be sure and check out her blog. What I'm suppose to do is to pass this on to three or five other blogs. Usually when I receive one of these I just pass it on to everyone - mainly because everyones blog is so special to me and I love them all! 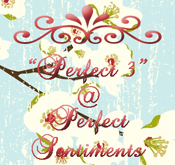 But I'll go ahead this time and pass it to three - very different blogs from three different ladies! 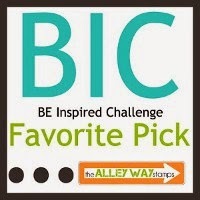 Babette - Babette's blog is called Sincerely, Babette - she mainly creates projects. And all of them are just fabulous. I don't usually think "outside the box" and stick with card making so it's a real treat for me to see different projects - Check out her blog and see what I'm talking about. 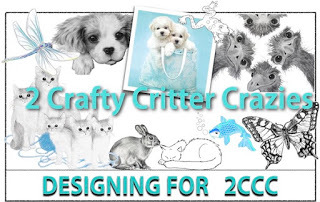 Maria - Maria's blog is called Crafty Creations - and she is just very crafty AND creative. She makes all these fantastic cards and just gives me so much inspiration. You'll be pleased with everything you see there and she's a sweetheart for sure - So head on over to Maria's blog. Mary - Mary calls her blog Southern Moments - don't you just love the name of that one. 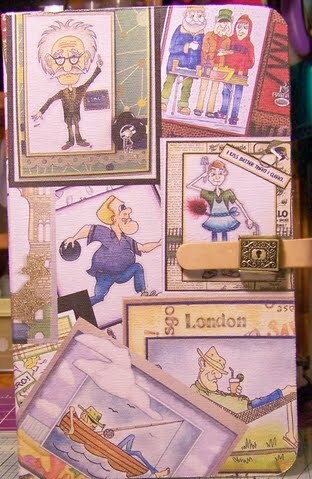 She does mainly scrapbook pages that are just gorgeous and amazing! I don't scrapbook at all (maybe someday) so I'm always just drooling after leaving her blog. Don't forget and check this out. So those are three very different blogs and all are wonderful. This is a very clean and simple, quick and easy, and a "git 'er done" card. This wonderful butterfly is from Kitchen Sink Stamps (the Butterfly set). I used some So Saffron, Daffodil Delight and Momento Tuxedo Black for the image. Add the white and black card stock, swirls embossing folder, bow (made with the Bow Easy) and some dimensionals - and it's completed. Hope everyone has a wonderful weekend and I'll be back on Monday. My very dear friend gave me FIVE garbage sacks (the BIG ones) FULL of stamping supplies-stamps, ribbon, more stamps, more ribbon, and just generally a load of stuff...so I'll be very busy this weekend trying to see where in the world I'm going to put all this!!! Get ready to do a little hopping today - because Dude Time Doodles is having a Blog Hop and we will be showcasing new images from Boni's STORE. 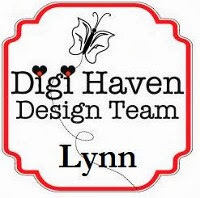 Be sure and leave some love while you're doing the Hop because one of the Design Team members will be secretly chosen as the MYSTERY HOSTESS of the blog hop and one lucky commenter will receive one of the new release images for free or any individual image of their choice. The Blog Hop does not have a starting and ending point so no matter where you Hop on you're in the right place. Just keep going and don't forget to leave a little love everywhere you land. Once you have gone full circle you have completed the Hop. On a sad note, we are saying goodbye to the wonderfully talented Nancy. Today is her last post as a Design Team member of Dude Time Doodles. She has promised to come back and share her wonderful work with us from time to time. Good luck and best wishes in your future endeavors Nancy. We'd also like you to welcome ChrissyD as your Guest Designer this month. You'll love her work. YOUR NEXT STOP ON THE HOP IS SHELLY! I guarantee you are going to LOVE her creation. 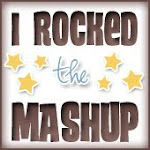 Thanks for stopping by............and be SURE and check out the BLOG HOP today. I hope everyone had a nice weekend! We had alot of football going on around our house today. I guess the Super Bowl is next up on the menu! While everyone was watching football, I did manage to get some time in my craft room. That was very nice. I saw the sketch over at The Paper Players and just had to play along! 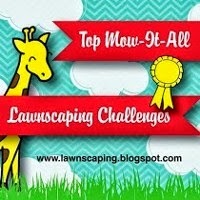 Go check out their challenge blog - lots of inspiration by the DT. I used the Watercolor Trio stamp set from SU and colored the image using SU markers. The lace is from that great "find" at a thrift store. You just never know what will turn up there. This is also for the challenge at Creative Inspirations Paints. Their challenge theme to to be inspired by the shades of your favorite color - and, as you can see, my favorite color is blue. 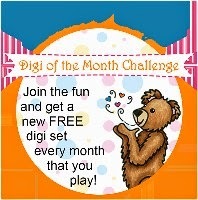 Also be sure and check out their challenge. 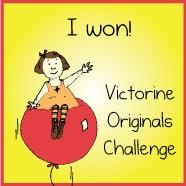 Oh - and just one more reminder on challenges......Stamps R Us has their challenge beginning today and the theme is to use an animal on your creation. 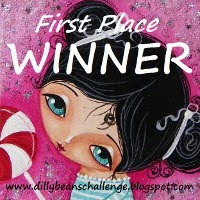 The winner will receive five digital images of their choice from Sew Many Cards. 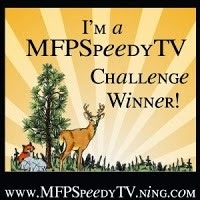 I'll be showing my card for this next week as their challenge runs for two weeks. 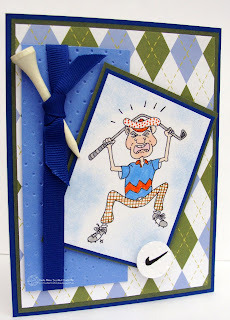 So....this card is for the challenges at The Paper Players and Creative Inspirations Paint. I look around "Blog-land" and see so many fantastic creations by all you ladies and gents (yes, I said "gents" - if you have time go check out Kevin's blog, McCrafty's Cards - wonderful inspiration there)...Anyway, as I was saying......all these great cards and projects out there with super coloring, beautiful flowers, and such gorgeous designer paper.......and then here I go with something just very plain and simple (you notice I didn't say "clean and simple" - because when I think of "clean" I think of alot of white space). Anyway........here's my creation. No flowers, frills, or beautiful coloring....does that make me bad! Hope you enjoy anyway. I used Crumb Cake, Real Red and white card stock. The images are from the SU set Filled With Love. I added the little button with floss and a single rhinestone. This will be entered in the following challenges: Mark's Finest Papers - to use a heart on your project and CES Challenges - no designer paper. Dude Time Doodles is having an Inspiration Challenge starting today! Be sure and check it out. You have one week to enter. 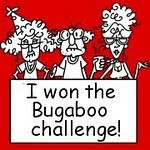 You could be named the Top Blog or one of the Top Three Blogs. The inspiration will be Anything But A Card. Be sure and keep in mind though, it's for a Dude!!! Boni's Inspiration project is called a Nook Book - isn't it adorable with some of the DTD images on it. Very creative to be sure and handy to have around too. For my "Anything But A Card" I created a little M and M container for my husband. I used the Armchair Arnie image you can get in Boni's STORE. When you see this image you think of your guy sitting in his favorite recliner watching a little TV, eating popcorn or peanuts, and drinking a beer or two. 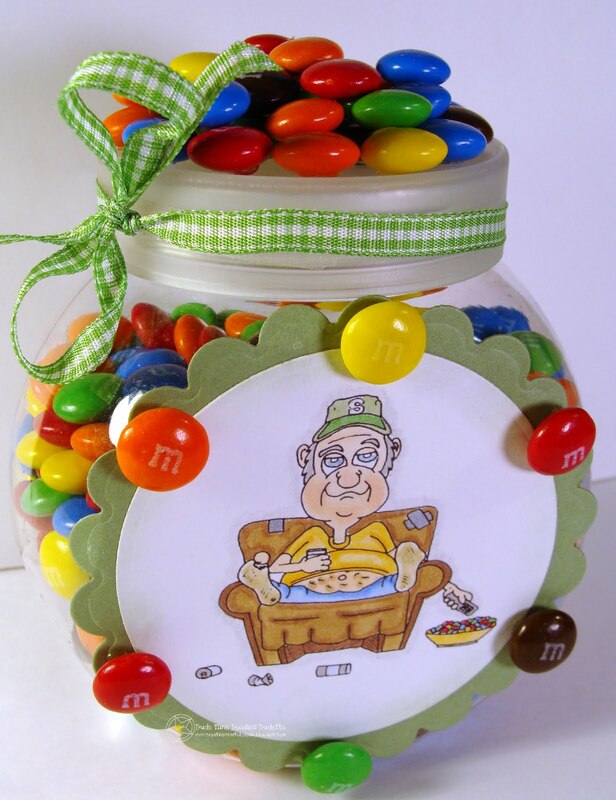 For this project though, he's sitting here watching the TV but is drinking a little Root Beer and eating M and M's! I think my husband has gotten addicted to those little candies and figured he needed something to store them in. The only problem I have is that he keeps trying to eat them off the lid too - glue dots and all! Plus I sprayed this with some type of clear acrylic stuff in had in the garage and really don't think that stuff would be good for human consumption! 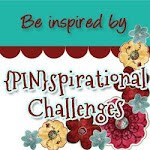 Be sure and check out the Inspiration Challenge today and Dude Time Doodles and submit your entry - and also take a peek at all the other DT's project - so much creativity! I refrained from making another Valentine's Day card and made a wedding card instead! 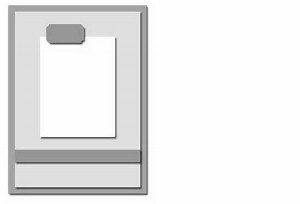 Very clean and simple but this embossing folder gives it an elegant look I think. When I first spied this folder at Hobby Lobby I kept thinking - "Um...will I even ever use it or am I just buying it because it's on sale"! I've used it ALOT! Certain images just fit perfect in it and I really like it. 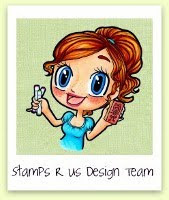 This image is from the Blissful Bride stamp set from SU. I added some of the tiny little pearls to the bow on the dress and then added some of the larger ones below the image. The organza ribbon is actually blue but looks more of an aqua color in the photo. I'll be entering this in the challenge at Creative Inspirations Paint for the theme, Inspired by Bling. Now some may think that pearls are not actually considered "bling"! But I do. Plus I researched it a little on the old computer and yes....we've got "bling" here folks!!! Hope everyone is having a wonderful Friday - and is going to have a great weekend! That's the nice thing about Friday - you know that the weekend starts tomorrow! This will be the last Valentine card for the week - promise! Several of the granddaughters are really just too old for the baby type Valentines and too young for the lovey, mushy ones....so thought this would be nice. I used Out for a Spin by OCL and added the little basket of hearts. 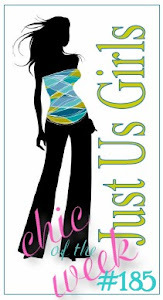 And of course, all little girls - no matter what their age - love the rhinestones! This was another quick and easy (and clean and simple) card to do. I used the Filled With Love set from SU and colored them with my SU markers before stamping. I've got almost all of the Valentine cards completed - need to do a few more for the young children in the family and will be finished. I MAY even get them mailed before Valentine's Day! Thanks for stopping by.......and be sure and see my previous post about the FREE IMAGE and Guest Designer spot over at Dude Time Doodles. Be sure and submit your entry! 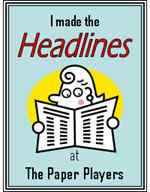 Now is your chance to be the Guest Designer for February over at Dude Time Doodles! You'll get a FREE IMAGE that is just delicious looking. You have one week to submit your photo using the free image and who knows...you could be the next Guest Designer for Dude Time Doodles. 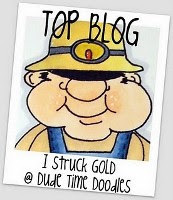 Check out Dude Time Doodles today, grab your FREE IMAGE, and then submit your project! While there, be sure and check out the inspiration that Chris (who is the guest designer this month) has left! Thanks for stopping by.........and I'll have another Valentine card posted later in the day. I usually send out about 15 Valentine cards every year - to the nieces, nephews, grandchildren, and a couple of adult family members. So get ready to see a few on my blog! This will be one for the adults this year. Very clean and simple but also pretty I think. 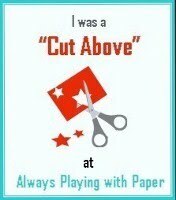 I ATTEMPTED a little distressing - but, as always, it just appears (at least to me) that I just need a new paper cutter!! I used some Cherry Cobbler (gotta love that color), and Very Vanilla. The image is from a set by CTMH called Soul Mates. The lace is some that I picked up not long ago at a thrift store. The reason I say "a little wonky" is because I was taking a picture of this outside and the wind kept blowing those little things this way and that. I know, I should have taken it inside, but it was such a nice day and I was determined to do it outside! Oh well! So, it may look a little "wonky". If you've been following my blog for a while you KNOW I do not normally do this type of thing! 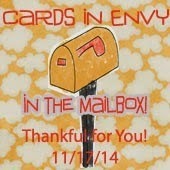 I mainly just do cards. 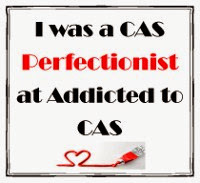 But I've been following a blog for some time called Sincerely, Babette and she just makes the cutest little projects all the time and has inspired me to TRY to break out of my mold and do different things. 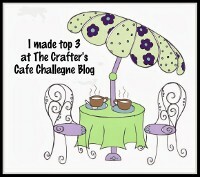 Check out Babette's blog and see all of her fabulous creations. This is a little pail I picked up last year after Valentine's Day. It has little cut-out hearts around the top of it (but you can't really see that in the photo). I filled it full of shredded paper and then cut dowel sticks I had painted white in the bucket. The images used are from Filled With Love and Love You Much (SU) and Soul Mates (CTMH). I also made a little "love note" to go with the pail and attached it using a very tiny clothes pin that I found in the office supply section of Walmart. Since this is the 1st Wednesday of the month, it's Sketch Challenge time over at the wonderful Dude Time Doodles site! Use this sketch for your creation and submit to Dude Time Doodles today. It MUST be a MASCULINE THEMED CREATION though as that's what DTD is all about! You have one week to submit your creation. 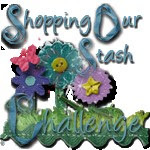 Our sponsor Rain Drop Echo Designs is sponsoring this weeks challenge. 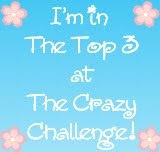 The winner of the Top Three and Top Blog will be announced on 1-11-11. Designer "Rain Drop Echo" as we know her, is also known as Ann. 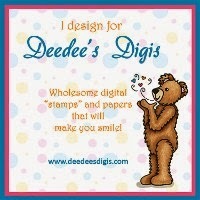 Ann creates sentiments and digital word art files and watermarks/custom watermarks which are available for purchase at Whimsy Stamps. She also coordinates the challenge blog Sentimental Sundays. 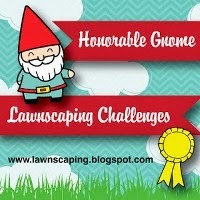 See Ann's blog for amazing projects. This cute image from Bonibleaux Designs is called Ride Like the Wind Rocky and Putt Putt Hearts! Isn't he just a hunk all decked out for his motorcycle ride - right into your heart! He's new and just in time for Valentine's Day (note the little "puff's" of heart shaped exhaust coming out of the tail pipes)! I colored him with Copics and Prismas and even added a little Creative Inspirations Paint to the head light and part of the motor. There's a little heart shaped button above the sentiment. Head over to Bonibleaux Designs and check out Rocky and Putt Putt Hearts along with all the other wonderful images. Thanks for stopping by..............AND BE SURE AND CHECK OUT THE SKETCH CHALLENGE OVER AT DUDE TIME DOODLES AND SUBMIT YOUR ENTRY! If you live in Texas you just HAVE to know what a bluebonnet is! It's the State Flower of Texas, blooms in the spring, and is simply gorgeous! This image is from Kitchen Sink Stamps and the flower is a four-step stamp and the butterfly is three step. I'm finally getting a little bit better lining these images up I think. I'd finally finished the card and hubby said that I really needed to have the butterfly sitting on the flower! Well, try as I might, that just was not going to happen - but it does look like it's coming in for a landing anyway!! I used all SU card stock and ink on this, along with some pearls, a SU punch, and ribbon. Although it appears to be black in the photo, the dark card stock is Night of Navy.